Baby Corns Cheese Veg Tacos is easy snack recipe which are can be made with ready to use Cornitos Taco shells. 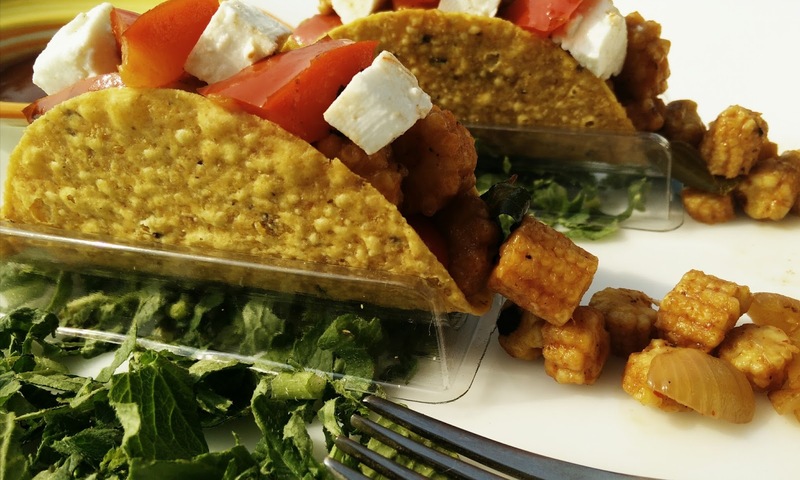 Taco shells can be stuffed with any kind of stuffing to make interesting snack recipes. Taco shells had reduced the process of making the base of tacos as well. 1. Steam baby corns in a pressure cooker with little salt. 2. Simultaneously, in a non –stick pan, sauté garlic, curry leaves, bell pepper, onion for 5 min. Add steamed bell pepper. Add all seasonings and cook for another 5 min. Switch off the flame and once cooled, add tomato ketchup. 3. Microwave Taco Shells for 30 sec to 1 min or put shells in preheated oven for 2 min to make these crispier. Once ready, stuff stir fry baby corns in each Taco shells. Garnish with cheese cubes and Stuffed Taco shells are ready to serve.